A pleurectomy is a surgical procedure that is done to remove part of the pleura, the linings that surround the lungs. It may be recommended for people with persistent pleural effusions, a pneumothorax that persists or recurs, or a cancer known as mesothelioma. Complications may include a persistent air leak (requiring a chest tube), infection, and bleeding. The prognosis after a pleurectomy depends on the underlying reason for the procedure. The lungs are surrounded by two pleural membranes; the parietal pleura on the outside, closest to the chest wall, and the visceral pleura on the inside, closest to the lungs. Between the pleura lines the pleural cavity. Ordinarily, there is a small amount of fluid in this space (roughly two to three teaspoons) which cushions and helps to lubricate the lung linings during respiration. The most common indication for a pleurectomy is to treat malignant mesothelioma. This cancer, which is often related to asbestos exposure, can arise from the pleural linings (pleural mesothelioma) as well as the linings of the heart and abdomen. When a pleurectomy is used to treat mesothelioma, it is often combined with a procedure called decortication (pleurectomy decortication). These procedures involve not only the removal of the pleura but of any adjacent tumor that may be present in the chest cavity. A pleurectomy may also be done for people who have persistent or recurrent pleural effusions when other procedures (such as pleurodesis, a procedure in which a substance is inserted between the two membranes causing them to scar together) fail to drain and prevent fluid from building up between the layers of pleura. Sometimes a pleural effusion is "multiloculated" meaning that there are several separate areas in which fluid can build up. This can make either inserting a stent or pleurodesis ineffective, and physicians may thus recommend a pleurectomy. By removing the pleura altogether, the build-up of fluid can then be prevented. A pleurectomy is used in a similar way to treat malignant pleural effusions. Malignant pleural effusions are pleural effusions in which cancer cells are present. They may arise from a primary lung cancer, or due to metastases from other cancers such as breast cancer. While the treatment of malignant pleural effusions is most often palliative (meaning that the procedure is done to improve quality of life but not to cure a disease), controlling the build-up of fluid can often improve shortness of breath and decrease pain. For people who have had two or more pneumothoraces (collapsed lungs) a pleurectomy may be done to prevent another recurrence. By removing the linings of the lungs (the pleura), there is no longer a space in which air can accumulate. 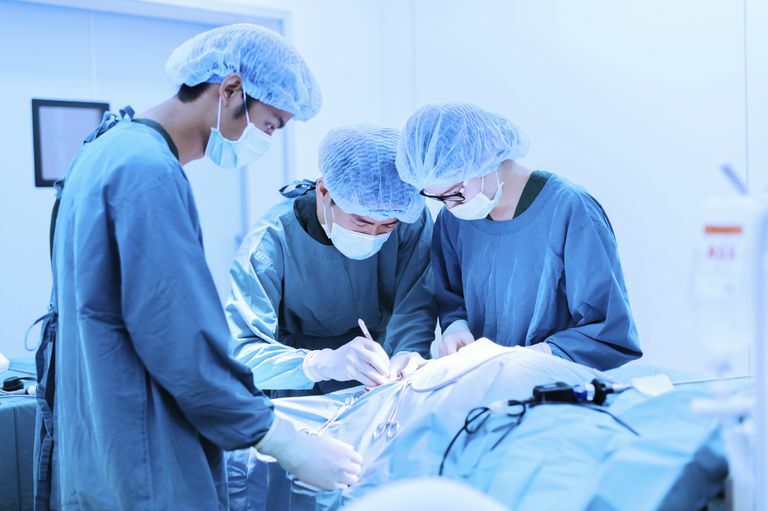 A pleurectomy is usually done under general anesthesia in the operating room. During the procedure, an incision is made along the back and parallel to the lungs (a thoracotomy). After gaining access to the chest, the surgeon then carefully peels away and removes the layers of pleura. Additional tissue may be removed if the doctor is operating for mesothelioma. Before the incision is closed, drainage tubes are placed which will be removed later on when the bleeding and discharge is small. The incision is then closed, often with sutures which will dissolve on their own. As with any surgical procedure, there are potential risks and complications. The chance of these occurring depends on the condition for which the procedure is being done, the overall health of the person having surgery, previous surgeries or radiation to the chest, and more. Complications may include inadequate removal of pleural tissue so that a pleural effusion or pneumothorax recurs, or inability to remove sufficient tissue in the case of mesothelioma. Scar tissue (adhesions) may develop in the chest and chronic pain may occur for some people. With mesothelioma, the risks often depend on the extent of cancer and the ability of the surgeon to access and remove the cancerous tissue. Respiratory therapy is usually involved throughout the recovery period, helping people to breathe deeply and get out of bed quickly to lower your risk of pneumonia, blood clots, and other complications. Pulmonary rehabilitation may be recommended down the line as well to improve breathing. In general, a pleurectomy is tolerated quite well. For people with malignant mesothelioma, it is most often a palliative treatment, meaning that it is done to reduce symptoms and improve comfort but does not cure the disease. A pleurectomy for people with mesothelioma may improve life expectancy, and improve symptoms of shortness of breath. A pleurectomy for a malignant pleural effusion is similar with regard to prognosis, and is primarily a palliative procedure. When a pleurectomy is done for people with recurrent pleural effusions or have had a recurrent pneumonthorax but are otherwise in good health, the prognosis is good. In fact, for children who have recurrent spontanous collapsed lungs (pneumothorax), a 2017 study found that the risk of recurrence was much lower following a pleurectomy than after treatments to scar the linings of the lung together (pleurodesis). A pleurectomy is a surgical procedure that carries risks, but can sometimes greatly improve life for people living with mesothelioma or a malignant pleural effusion. For those who have been coping with a recurrent collapsed lung or recurrent pleural effusions, a pleurectomy can sometimes resolve the problem completely. Cao, C., Tian, D., Park, J. et al. A systematic review and meta-analysis of surgical treatments for malignant pleural mesothelioma. Lung Cancer. 2014. 83(2):240-5. Hasegawa, S. Extrapleural pneumonectomy or pleurectomy/decortication for malignant pleural mesothelioma. General Thoracic and Cardiovascular Surgery. 2014. 62(9):516-21. Vlahu, T., and W. Vigneswaran. Pleurectomy and Decortication. Annals of Translational Medicine. 2017. 5(11):246. Joharifard, S., Coakley, B., and S. Butterworth. Pleurectomy Versus Pleural Abrasion for Primary Spontaneous Pneumothorax in Children. Journal of Pediatric Surgery. 2017. 52(5):680-683.